please ask a member of staff if you have any food allergies or special dietary requirements. Gluten free menu available please click here. 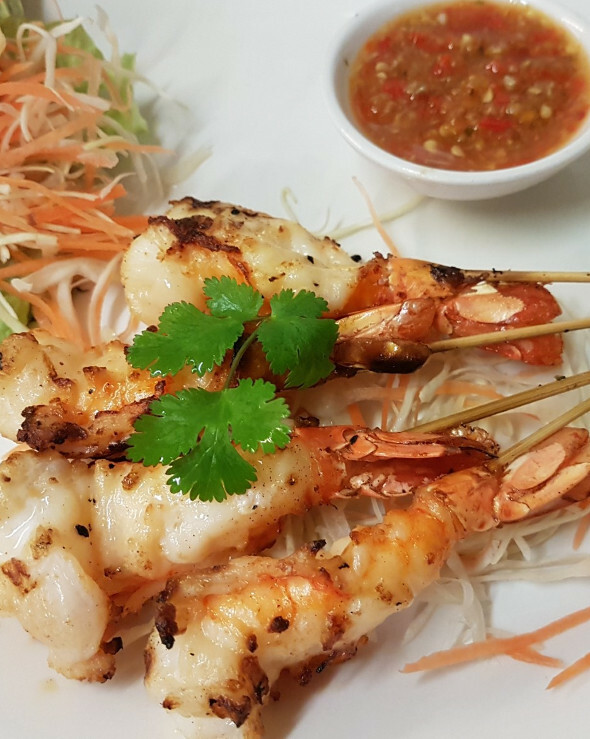 Grilled king prawns on skewers served with spicy seafood sauce. 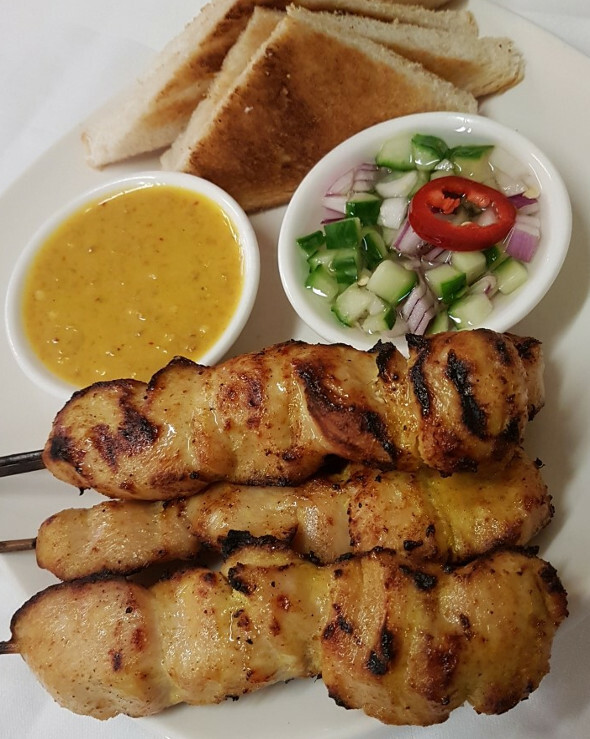 Marinated skewers of chicken served with peanut sauce and Thai vegetables pickle. Marinated spare ribs in ginger & black pepper. Thai spring rolls with minced chicken and savoury fillnggs with homemade sweet chilli sauce. Vegetarian spring rolls served with homemade sweet chilli sauce. Mushroom satay, Marinated mushroom on skewers served with peanut sauce and Thai vegetables pickle. Grilled marinated pork on skewers served with sweet chilli sauce. Pranw spring rolls served with sweet chilli sauce. Sweet corn cake served with cucumber, crushed peanut and sweet chilli sauce. 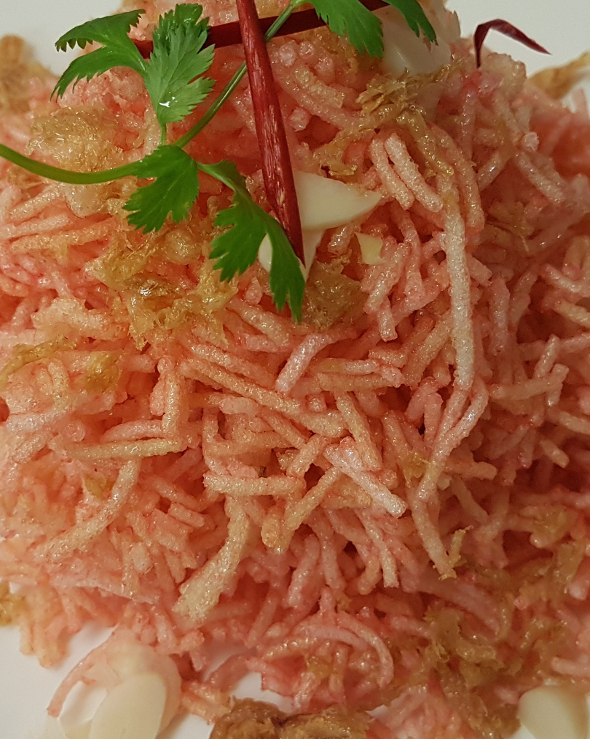 Minced prawn and pork on toasts sprinkled with sesame seed served with sweet chilli sauce. Prawns and mixed vegetables in homemade tempura batter served with sweet chilli sauce. Mixed vegetables in homemade tempura batter served with sweet chilli sauce. Mixed starter platter: Chicken satay, Prawn & Pork on toasts, Thai fish cake and Chicken spring rolls. Vegetarian mixed starter platter: Mushroom satay, Vegetarian spring rolls, Sweet corn cake and Crispy wonton. Fresh scallops with chilli oil topped with sweet basil leaves. 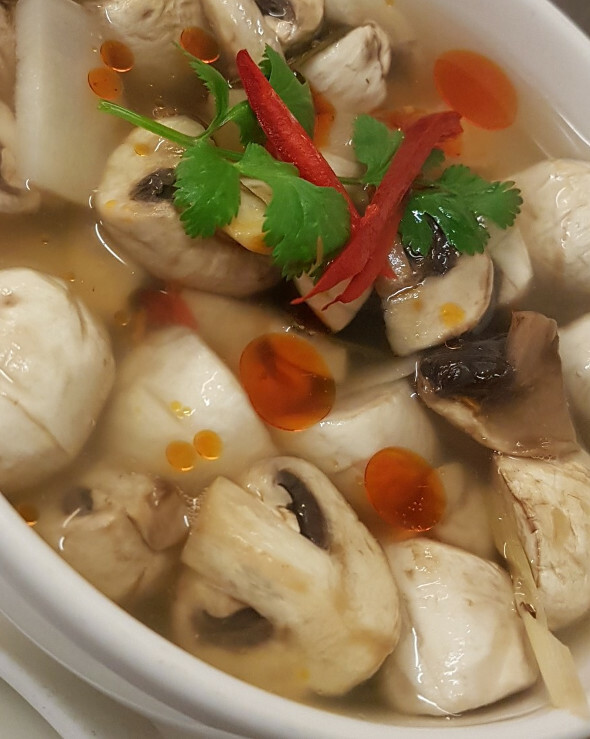 Our Chef's special, King prawn hot & sour soup topped with a dash of coconut milk. Classic Thai hot & sour clear soup. 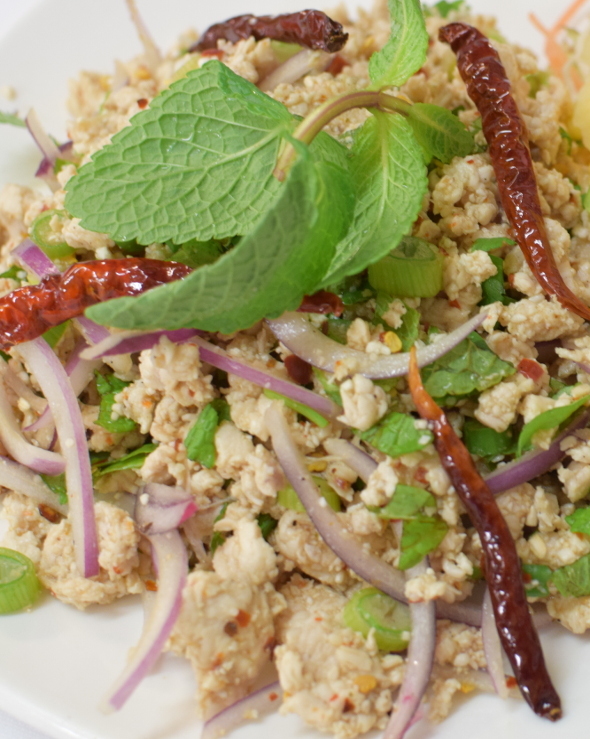 Spicy minced chicken salad with mint, onion and dried chilli. Tender beef sirloin served with spicy salad and mint. The legendary spicy Thai papaya salad served with grilled chiken skewers. Crispy seabass fillets topped with chef's special chilli, garlic and fresh basil sauce. Crispy seabass fillets topped with dry curry sauce and finely chopped lime leaves. Steamed seabass fillets with soya sauce, ginger and spring onion. Steamed seabass fillets with chilli, lime juice and garlic. 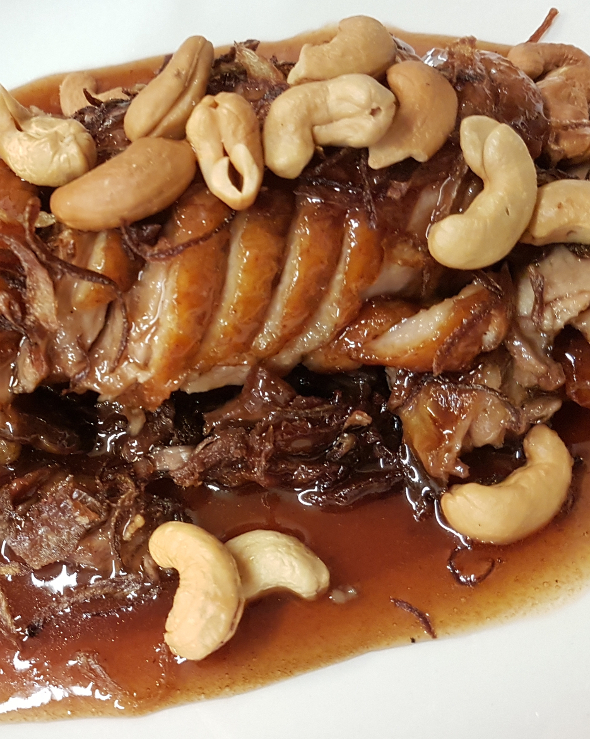 Roasted duck with tamarind sauce, topped with caramelised onion and cashew nut. 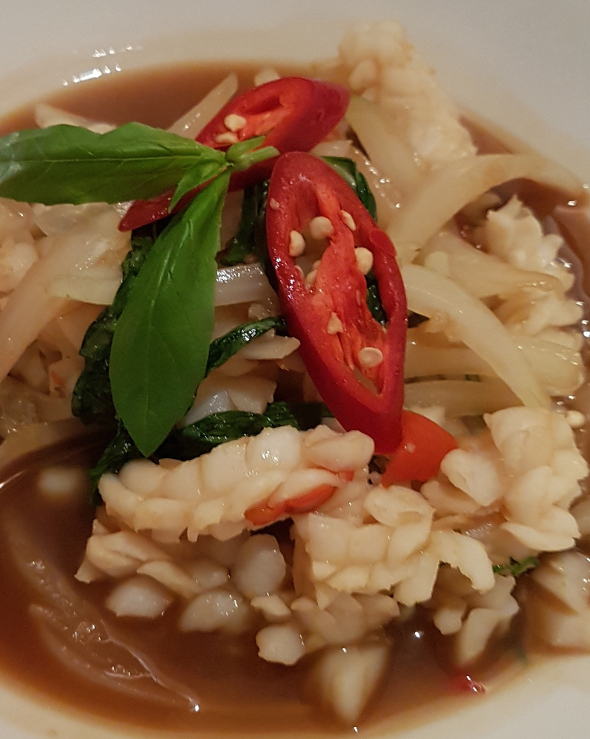 Stir-fried with basil leaves and fresh chilli with squid. Stir-fried with garlic & black pepper. Stir-fried with basil leaves and fresh chilli. Stir-fried with ginger, onion and black wood fungus mushroom. Stir-fried chicken with cashew nut, mushroom and dried chilli. Stir-fried with oyster sauce and fresh vegetables. Stir-fried Thai style sweet and sour with fresh vegtables. Stir-fried with kaffir lime leaf, fresh chilli and fine beans. Beef marinated in oyster sauce and coriander seed, served with crispy basil leaves. Wok-fried Thai broccoli with chilli, garlic and yellow bean sauce. Fried rice with egg, tomato and onion. 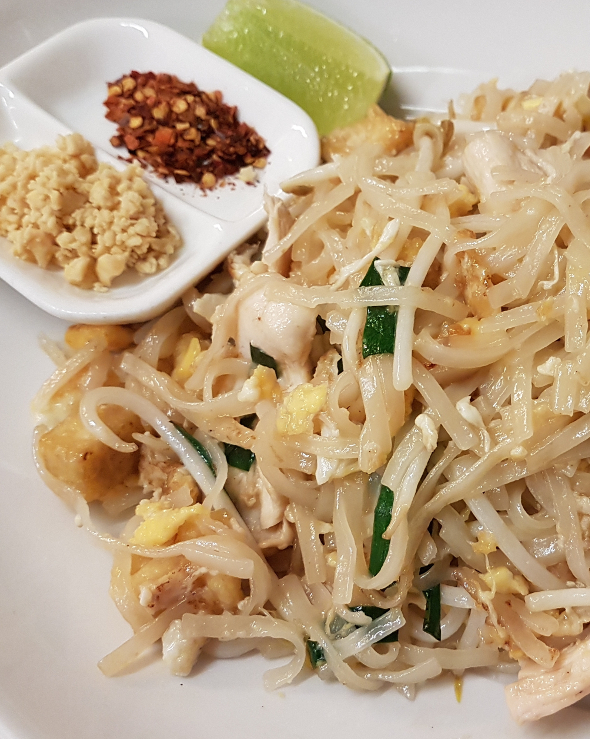 Special Thai style fried rice noodle with egg and bean sprout. Spicy froed rice noodle with egg and Thai broccoli. Stir-fried soft rice noodle with egg, Thai broccoli and soya sauce. Thai Green coconut milk curry with bamboo shoot strips. Thai red coconut milk curry with bamboo shoot strips. 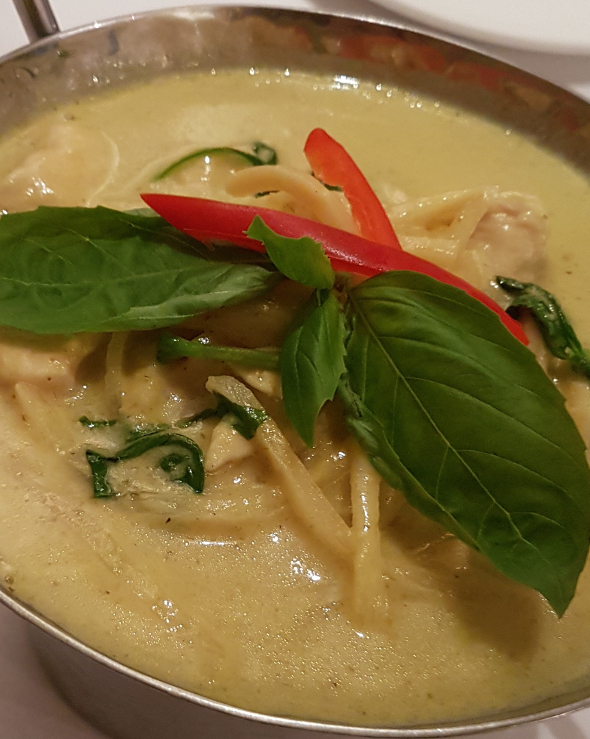 A unique Thai coconut milk dry curry flavoured with kaffir lime leaves. Rich and creamy coconut milk curry with potato, shallots and peanut. Mouthwatering red curry with roasted duck, cherry tomatoes, grapes, pineapple and rambutan. Steamed glutinous rice served in traditional bamboo basket. Plain fried soft noodle with bean sprout. Sweet & sour crispy noodle. Banana pieces coated in a light batter served with vanilla ice cream topped with maple syrup. Our unique pastry and chocolate dessert served with chocolate sauce and stem ginger ice cream. 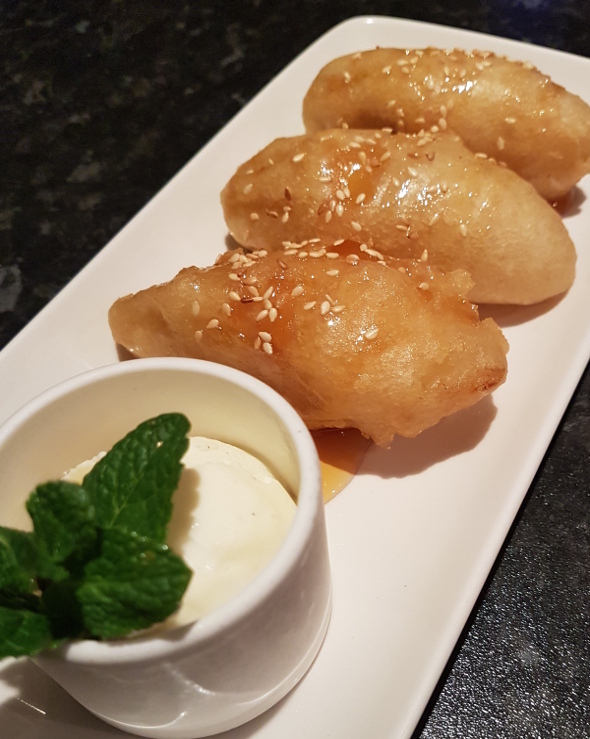 Banana pieces coated in a light batter served with vanilla ice cream topped with maple syrup and roasted sesame seeds. A traditional Thai dessert! Banana pieces in rich sweetened coconut milk topped with roasted sesame seed, served hot. The finest natural blend of cocoa powder makes for a real chocolate taste. Strawberry fruit pieces, combined with rich creamy strawberry ice cream. Tropical mango ice cream with tangy passionfruit ripple. 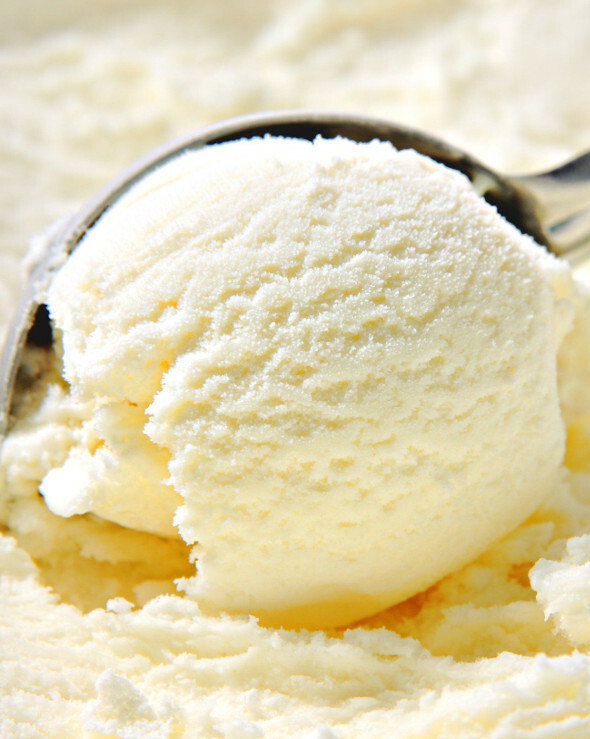 Plain ice cream contains scrumptious chunks of cinder toffee. A delicate natural vanilla, speckled with vanilla pod seeds. Finest bananas are pured combined with toffee pieces. Fragrant, sweet and warm tasting cinnamon spice. Delicate and truly delicious coconut ice cream. Also from Cheshire Farm and free from artificial colour, flavours and contain no eggs - suitable for vegetarians. Famous Cheshire Farm Ice Cream. The Finest Thai food in comfortable fresh surroundings with all 3 locations being newly renovated. Regent Road, Altrincham former ‘Grapes’, premises, Wilmslow at The Kings Arms Pub and Hotel by the roundabout and in Sandbach!!. Website Design siridesign.co.uk. All rights reserved.